Sleeping bags may be hired for $15 to be paid on the day of the tour. Please let us know when you book if you require a sleeping bag. 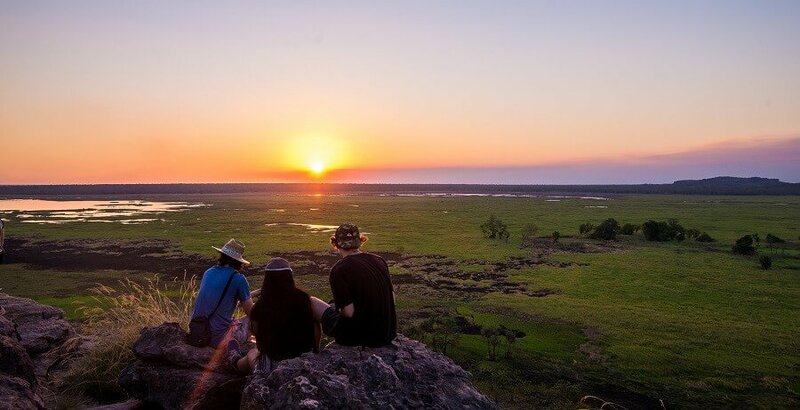 Experience the five major landmarks in the Kakadu National Park on this five-day adventure. 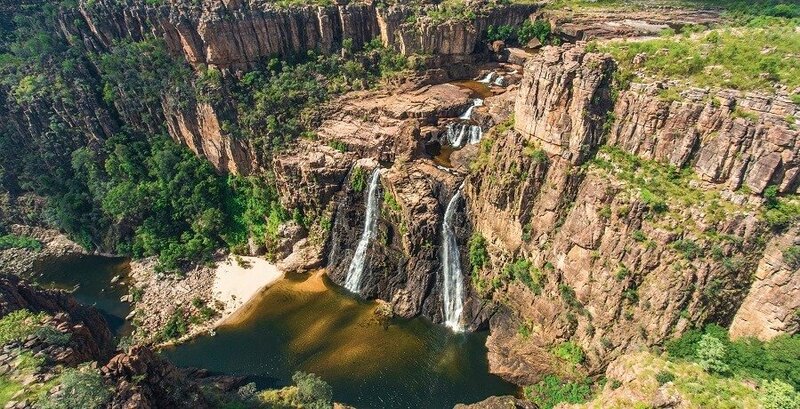 Explore Jim Jim Falls, Twin Falls, Koolpin Gorge, Maguk, and Gunlom Falls, as well as the incredible Aboriginal artwork that decorates the region and the sprawling beauty of the surroundings. 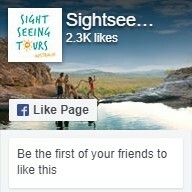 We’ll head straight to Kakadu, stopping on the way at the White Lily Billabong for morning tea. Then it’s on to Gunlom Falls, where you can take a hike to the peak of the waterfall and marvel at the views below. Cool off in the pools if you wish, and discover the sandy beach at the base. We’ll camp overnight at Gunlom right by the waterfall. Day two is packed full of fun, and we’ll start the adventures at Koolpin Gorge. This area is special permit access only, with visitors limited to 40 people per day, because of its cultural and environmental sensitivity. While here, you can walk up the gorge through lush wilderness, discovering crystal clear rock pools as you go. We’ll return to Gunlom at night to once again camp under the stars. 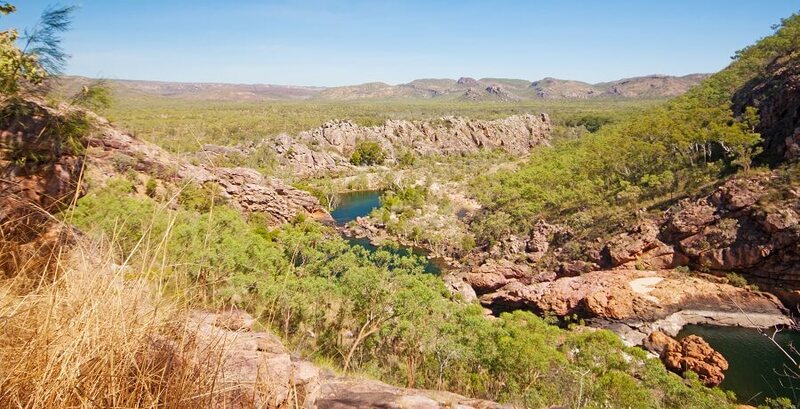 In the morning of the third day we’ll head to Maguk (also known as Barramundi Gorge), where you’ll spend the entire day hiking, swimming, and exploring. We’ll show you hidden hotspots before you tuck into lunch, and then we’ll head north to Jim Jim Falls. Our home for the night is the exclusive safari camp at Garnamarr. We’ll head to Twin Falls via 4WD first thing after breakfast, where we’ll then take the escarpment walk to the top of the falls and cool off in the pools. Then we’ll move on to Jim Jim Creek for some lunch and enjoy the views from Budjimi Lookout. Once we’ve refuelled, we’ll take a short walk through the lush vine forests and have a relaxing afternoon at the base of the falls. Overnight, we’ll stay at Mardugal after a traditional Aussie BBQ complete with crocodile, buffalo, and kangaroo. 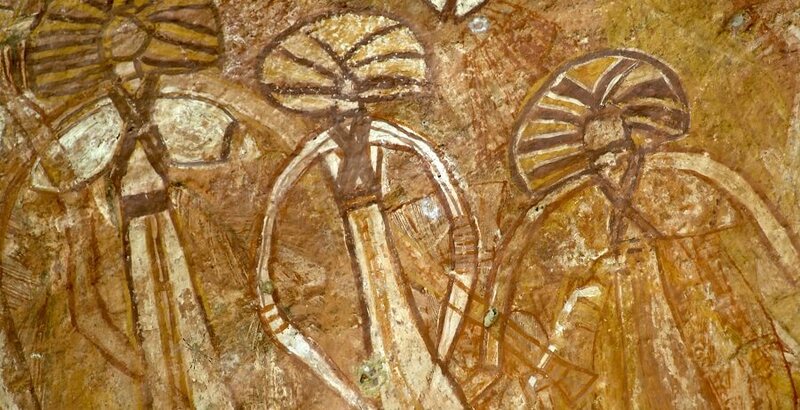 On the last day, we’ll head to Nourlangie Rock to learn about the fascinating aboriginal art history of the region. 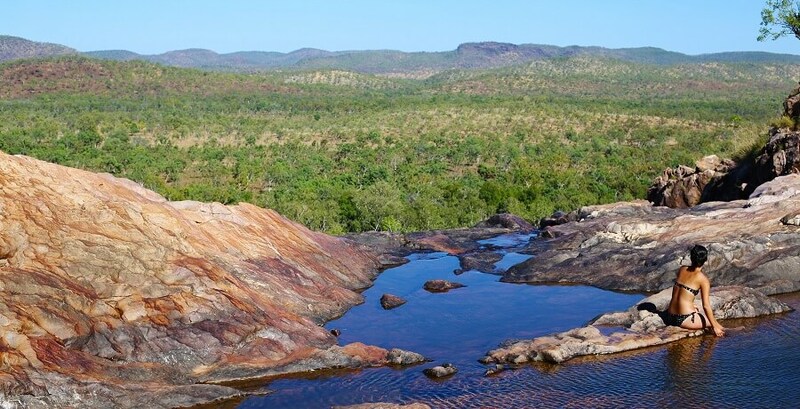 We’ll then walk up to Gunwhardewharde lookout for amazing views over Arnhemland and stop off at the Bowali Information Centre. 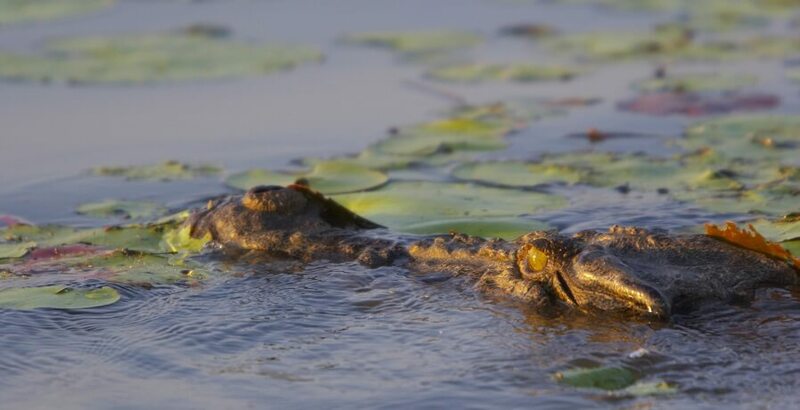 As we make our way back to Darwin, we’ll call in at the Mamukala wetlands so you can discover some of the colourful birdlife in the area, and we’ll finish off with a wildlife cruise on the Corroboree Billabong.